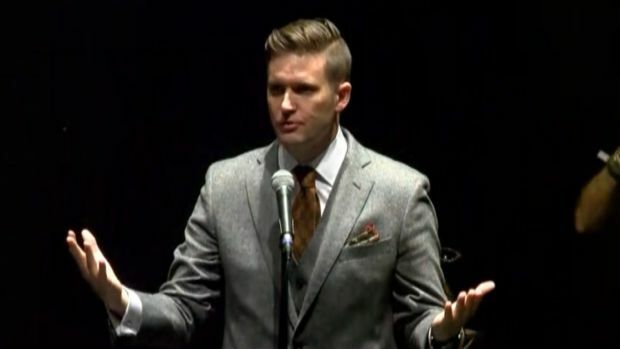 FILE - In this Dec. 6, 2016, file photo, Richard Spencer, who leads a movement that mixes racism, white nationalism and populism, speaks at the Texas A&M University campus in College Station, Texas. The wife of white nationalist leader Richard Spencer has accused him of physically, verbally and emotionally abusing her throughout their eight-year marriage. In a court filing for the couple's divorce proceedings in Montana, Nina Koupriianova said Spencer once left her with bruises after dragging her out of bed and down stairs in 2011. She also said he "attacked" and bruised her again in 2014, when she was four months pregnant with their first child. Spencer told The Associated Press on Tuesday that he is "not an abusive person" and said his wife was "never in a dangerous situation." In a court filing in August, Spencer said he disputes "many of her assertions." "More importantly, none of the allegations of 'abuse' have anything to do with my children," he said in the filing. 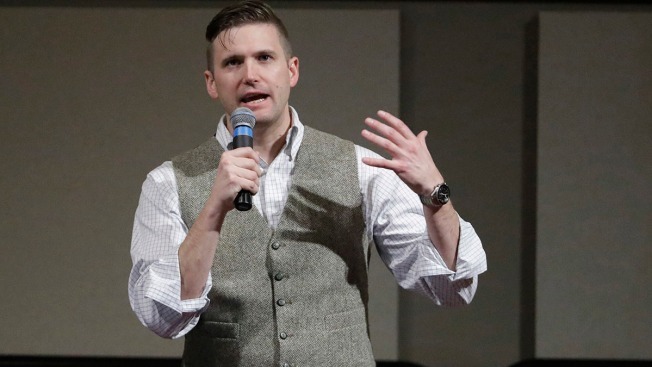 Spencer popularized the term "alt-right" to describe a fringe movement that's a loose mix of white nationalism, anti-Semitism and other far-right extremist views. He was scheduled to speak at the Unite the Right rally in August 2017 before violence erupted in the streets of Charlottesville. A man fascinated with Adolf Hitler plowed his car into a crowd of people that day, killing counterprotester Heather Heyer, according to authorities. After the deadly Charlottesville rally, Spencer launched a college tour but cut it short following violence outside a speech he was giving at Michigan State University's campus. BuzzFeed News first reported Koupriianova's abuse allegations, which she outlined in a 78-page court filing in June. Koupriianova said Spencer became more concerned about his safety after he was punched in Washington, D.C., on the day of President Donald Trump's inauguration — an assault that was captured on a video that quickly spread on social media. Spencer's wife said he once left a loaded pistol on a table in their bedroom "without any safety precautions." "Due to the fact that [Spencer] still engages in extremely polarizing public speech, I am extremely concerned that he may continue leaving loaded weapons at his place of residence or at his parents' house, where he stays when he visits Whitefish, Montana," she wrote. She also said Spencer's "political activities" make their whole family "potential targets." The couple married in 2010 and shared an apartment in Whitefish before they began living separately in July 2017.